The Braesgate house started out as the home Sue Ann raised her children in. 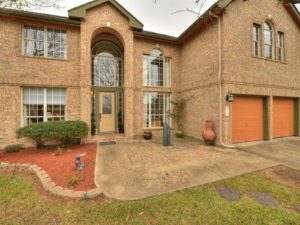 It’s in a nice Austin suburb called the Meadows of Brushy Creek, with good schools, lots of trees, and good neighbors. Once all of the children (Sue Ann’s and the ones she took in over the years) and Lee, who spends his time at the ranch in Cameron, moved out, a five-bedroom, four bathroom house with three living areas seemed awfully big. The original plan was to sell it as soon as the Bobcat house was ready. Well, that took a LOT longer than expected, but finally did happen. Before all that, this is the house we started our current renovation and rehab experience with. Here’s the history of what our team did to improve the house. We met our most used general contractor, Ruben, through working on this house. A neighbor recommended him. We really liked his work, so kept bringing his crews on as we re-did various rooms. When we formed Hermit Haus Redevelopment, we brought him on for many of our projects. And they did all the finishing on our ranch house. I guess he’s made some bucks on us. We have had lots of fun, arguments, ups, and downs, but we are sticking with each other. So, here are some pictures of the rooms we improved on the Braesgate house together. The upgraded kitchen. Still looks good after 4 years. 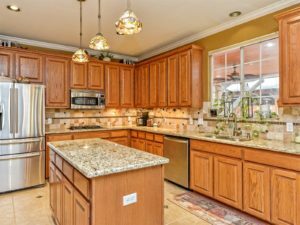 The house had a lot of upgrades when it was built in the late 90s, but of course, houses get “dated.” We first updated the kitchen. Gone was my beloved pansy wallpaper, along with a very boring builder backsplash and vinyl floors we originally had planned to only keep a couple of years. We added stainless steel appliances, all upgraded. The cooktop was especially great–all glass and so easy to clean. The backsplash was lovely natural travertine stone with glass insets, and the tile floors also had glass insets. Of course, we added granite counters and upgraded the lighting. Looking the other way at the kitchen. No more pansy wallpaper! All natural stuff. The house had a mission-style lighting theme that we figured we could change when we went to sell the house. We kept the original cabinets. I happened to like them, and they went with the all-natural materials look I was going for. 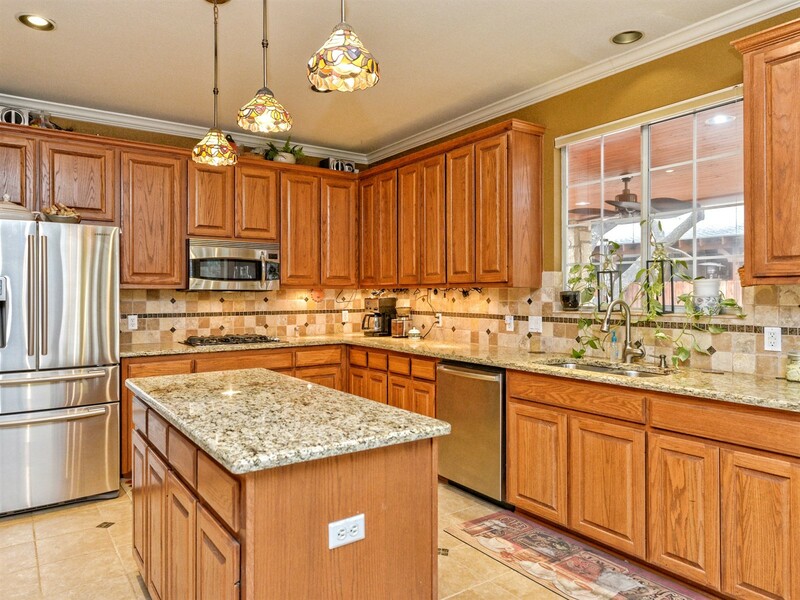 A lot of fun cooking happened in that kitchen, and it still looked great when time came to sell. The natural materials did not age. 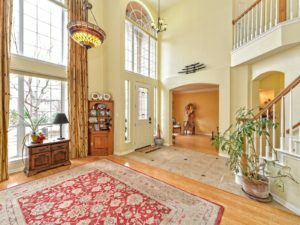 The two-story dining room, and intimate formal living area are just two highlights of the house. One of the biggest upgrades we did was get rid of the dark green carpet (hey, I LIKED it, and planned to change it before I sold the house–I got over a decade of enjoyment out of that carpet). 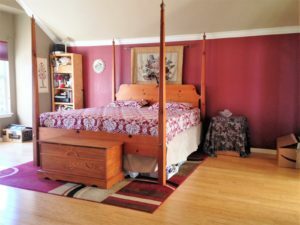 We installed bamboo flooring in the downstairs areas that were not already tiled in the kitchen upgrade, and also put it in the master bedroom. The plan was to eventually replace the carpeting in the rest of the upstairs, but we never did it. Thank goodness, since an ancient dog that stayed with us a few months ruined the old carpet (better than ruining new carpet). The photo shows the dining room looking into the formal living room. Most of the furniture had taken a hike, but you can see the floors (and the wonderful open entry area). Plus, look at those giant curtains I bought. That was a LOT of silk. There’s the shower that we made just a bit bigger. Nice. We eventually ended up renovating all the bathrooms. 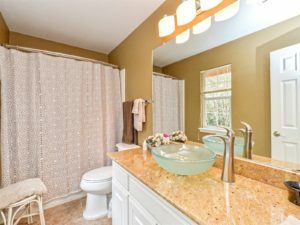 The master bath came first, and it went from a boring builder-grade room with gold fixtures and green tile (I like green) to another very natural-looking room that made it fun to keep clean. The very best thing that happened in that room was that Ruben figured out a way to make the rather small shower just a few inches bigger, and put in a seat. That made a really big difference. 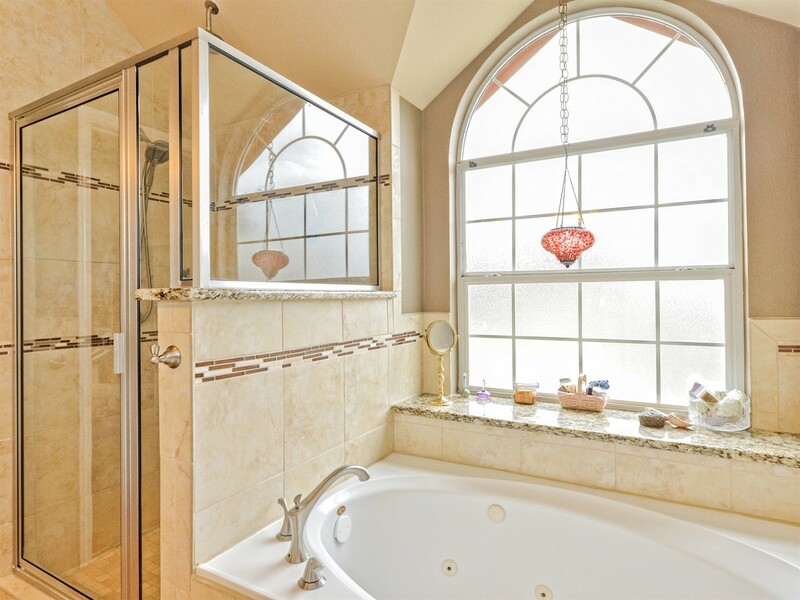 We also splurged and put in four of those wall-mounted spraying shower heads and a rain-shower head. Lots of ways to get water! By replacing all the fixtures, adding granite, and putting in some rather cool sinks (that I wish I had kept), the room looked totally different. The guest bath could not be more neutral, but it has a cool sink and faucet, and nice lighting. The other two upstairs bathrooms got upgraded, too, like I said. The en-suite guest bath just became a very neutral tan room, but it did get granite and a cool sink. The former kids bathroom went through a couple of incarnations. 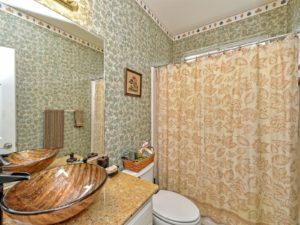 For a few years it was purple, at the request of the resident young adults, but when we re-did the guest bathroom, we also painted that one a neutral color. So, I DID make some changes with an eye toward resale! Really. And they all got granite (we had a deal), even the downstairs bath that I didn’t change much. It’s the only room I left the wallpaper in, because it was beautiful. But it got a new sink and counter-tops, so a little upgrade, anyway. It got new floors when we did the kitchen. This gives you an idea of the color scheme, though our nightstands are gone, so it doesn’t look great. The bedrooms in the house went through many phases over the years. The master got painted a rather unique combination of dark red and two shades of brown. It sounded awful but actually looked great. I really did intend to make that whole room neutral before selling it. Those colors were definitely not something the average buyer would love. I enjoyed my years with that room. The crown molding really popped against the other colors, and they made the huge room feel cozy. The other three upstairs rooms, well, other than taking my old-lady looking lilac and spring green master bedroom into a tan room, not much got done. I planned to repaint both my kids’ rooms, but ended up not having to do so. One room had a really odd paint job that was intended to resemble a rainstorm, perfect for a moody teen. Not perfect for anyone else. I assume it is getting repainted, even as I type this. But the house had four bedrooms upstairs, and three baths. My favorite bathroom, the “leaf” room. There was a fifth bedroom downstairs. We used it as an office, but it would have made a great “granny suite, since the downstairs bath was a full bathroom. What the heck, I may as well share a picture of that bath (the office did not look too great when these photos were taken, since we were in the middle of our many-phased move. View of the back porch and gazebo. The rock posts were fun to watch as the talented mason cut them to fit. The inside wasn’t the only place we made upgrades. The back yard of the cul-de-sac house was a large triangle, and at one time was quite jungle-like thanks to many oak trees. 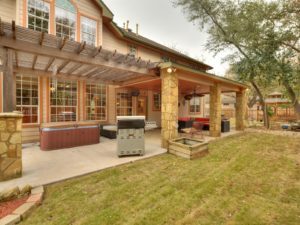 After the kitchen and bathrooms, the next project we engaged in was to create an AMAZING back porch that was great for entertaining. We also added a shed, lots of beautiful landscaping, and a fantastic gazebo. We also removed a tree that we’d loved, but was trying to tear up the roof. If it weren’t for the folks behind us blasting their outdoor television at us, the porch and surroundings would have been a really relaxing retreat. Before the loud neighbors, though, there were many relaxing evenings spent out there, enjoying the plants and birds. What you can’t see on the updated spaces in the Braesgate house is the quality. The house was originally built to high standards. Yes, it’s a house in a development, but it was a Scott Felder home, one of the better companies in operation at the time, and our construction supervisor was super. And eagle-eyed Sue Ann made sure there weren’t any slip-ups in construction. And all the upgrades and improvements were done to higher standards than most in the neighborhood (we figured we’d get our money’s worth in enjoyment). Natural materials were used whenever possible, even the ceiling of the patio is wood! Quality has been important to us for many years before we started the Hermit Haus Redevelopment team, and we hope it shows in this home. The HVAC was a really good one, and the roof and paint were renovated to last a long time. The original plan for the house was to get most of the furniture out of it (to the ranch house or our Villa Park casita/temporary residence), then put in neutral paint and carpet throughout the house. The repairs would have ended up costing a few thousand dollars, not counting the additional expenses to pay for another month or so of utilities, mortgage, and taxes. 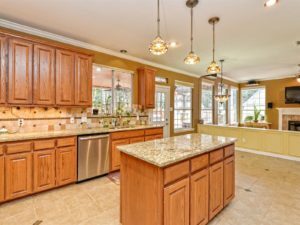 We decided, instead, to go ahead and put the house on the market in its current state, and provide an allowance to any purchaser, so they could choose their own flooring and paint colors. That worked! We ended up accepting an offer of our original asking price of $399K, minus the allowance. Saved us a lot of time and money! The house has a new family to enjoy it, and Ruben’s making the upgrades, too, since he knows the house so well. Since Sue Ann originally paid less than $200K for the house, and although we had spent money on all the upgrades, we still came out ahead. Plus, we got to enjoy all the upgrades a while before selling.